A privately led armoured vehicle sector has enhanced UAE armoured vehicle production. The domestic production of armoured vehicles in the Middle East is part of an unlikely tradition that has paved the way for further capability developments within several Middle East North Africa (MENA) states. Jordan, Saudi Arabia, Turkey, and the United Arab Emirates (UAE), are the leading Arab states within the field of indigenous production of armoured vehicles. Prompted by the need for greater operational independence, advanced technical understanding and an optimised procurement cycle that can alleviate financial burdens, the regional production of armoured vehicles clearly signifies an achievable example for other developing states. Most recently, the UAE has made progress moving from state-led and foreign sponsored maintenance, repair, and overhaul (MRO) capabilities, to an ecosystem that has attracted and fostered a privately led armoured vehicle sector, which has enhanced UAE-based production. The development of international armoured vehicle market capabilities has somewhat stagnated in recent years, however, since the wars in Afghanistan and Iraq, a greater emphasis has been placed on Mine Resistant Ambush Protected (MRAP) armoured vehicle protective capabilities. This has seen the capability gap narrow with non-traditional manufacturers reducing the market share of traditional market leaders. Armoured vehicle production capabilities were prompted by Abu Dhabi’s 1995 purchase of more than 400 French-built Leclerc main battle tanks (MBTs); the delivery was completed in 2004. The domestic production and servicing capability of primarily Emirati vehicles was prioritised by the Emirati leadership, and thus Al Taif Technical Services and NIMR were born; the former focusing on providing MRO services and the latter manufacturing armoured vehicles. Al Taif was established in 2006, under the umbrella of the Abu Dhabi-based sovereign wealth fund (SWF), Mubadala. Its premise was to provide MRO services to the UAE General Headquarters (GHQ), act as a conduit for strategic partnerships with original equipment manufacturers (OEMs) and to contribute to an integrated life-cycle support system. Thus, Al Taif signed a 20-year contract to formalise its long-term support and assistance to the UAE Armed Forces, with only one pricing amendment so far. Al Taif succeeded because of its direct assistance from OEMs. It is an integral and successful example of the public-private partnership (PPP) that has suited both the Emiratis and foreign entities. Burdened by its deficiency in critical and well-trained personnel, the UAE must lean on private capabilities to supplement its own resources to ensure a well-maintained operational force. NIMR was announced in 2000 as a joint venture with Jordan’s King Abdullah II Design and Development Bureau (KAADB) and Bin Jaber Enterprises. NIMR’s design was initially constructed with aid from Russia’s Gorky Automobile Plant. To develop and propel NIMR platforms, MBDA and Rheinmetall contributed to the evolution of NIMR variants. 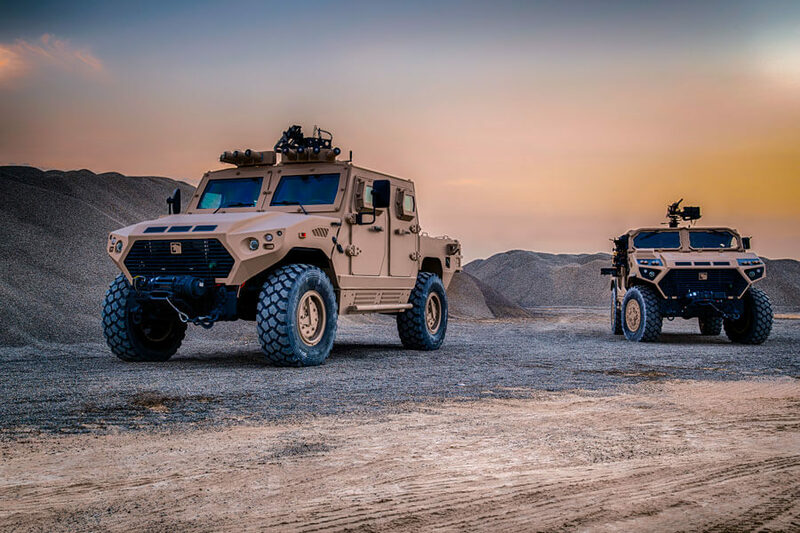 In November 2015 it was announced that NIMR had signed a $63 million contract with Denel Vehicle Systems of South Africa for the license to produce N35 (formerly RG-35) vehicles in the UAE. NIMR’s development was promptly built on at IDEX 2001 where the first public prototype of its 4x4 range was displayed. AT IDEX 2005, the first 6x6 variant appeared and signalled the rise of the Emiratis' focus on the domestic production of capabilities. Five years later, the AbuDhabi-based investment fund, Tawazun, acquired a 60% stake in NIMR with the remaining 40% still owned privately. Subsequently, UAE facilities were expanded with a new 37,000sq metres factory commencing construction at Tawazun Industrial Park (TIP) a year later, and the following year, an agreement was signed with Algeria to jointly produce an unannounced number of 4x4 armoured station wagons. With the 2014 announcement of the formation of the Emirates Defence Industrial Company (EDIC), NIMR transferred majority ownership to the newly established state conglomerate. Other platforms built by Abu Dhabi have included: the Mini Jobaria Multi Launch Rocket System (MLRS), in combination with Turkey’s Roketsan; and the Enigma 8×8 Armoured Modular Fighting Vehicle developed by Emirates Defense Technology. In addition, the inclusion of a BAE Systems' M777 155mm lightweight Howitzer complemented the Engima 8x8. The design of UAE manufactured platforms has arrived because of the successful transfer of technology. Only recently has the UAE closed the production loop, sending feedback and projecting future operational requirements. While in some areas of the UAE defence industry, there is a clear utilisation of domestically produced technology (munitions and UAVs), the state-owned production of armoured vehicles lags. Given the contrasting success of Al Taif, the advancement of the UAE’s MRO proficiency should be prioritised to ensure the UAE maintains its momentum within this sector. In combination with state-led efforts, several privately-owned entities appeared, which complemented and competed with state-owned organisations. Companies that have successfully utilised the UAE as an operating base include: Streit Group, Mezcal Security Vehicles, Inkas Vehicles, Minerva Special Purpose Vehicles (MSPV), Shell Armored Vehicles, Harrow Security Vehicles and ASV Armored Cars. The most prominent and successful example is Streit Group; a Canadian manufacturer who established its first overseas manufacturing facility in 2008 when its registered its UAE presence in the northern town of Ras al-Kahimah. Streit Group builds a wide array of armoured vehicles including MRAP armoured personnel carriers, tactical armoured vehicles, and is well known for its capability in manufacturing armoured civilian cars. Streit Group is famed for its independence as a private entity operating independently from branch to branch; its UAE office is a separate entity from its Canadian branch. Thus, it can offer high specification capabilities without referring to international legislation as stringently as other more pronounced manufacturers. Streit Group holds a series of international manufacturing qualifications and is lauded for its promptly available and cost-efficient platforms. Private sector manufacturers are attracted to the UAE due to its mix of liberal trade and licensing laws, free zone ownership legislation, low manpower costs, and its position within a region of high military spending. The dual track approach taken by the Emiratis has placed a similar emphasis on the successful export of domestically manufactured vehicles to subsidise national capabilities as well as provide domestic MRO services. NIMR succeeded in this sector with its 2014 co-production agreement with Algeria standing out as a clear indication of its achievements. Further successes came when in 2009, Libya ordered 120 of the 4x4 variants. This stands in contrast to the procurement of more than 1,000 NIMR vehicles by the UAE Armed Forces. It should be noted that when in 2013, UAE GHQ ordered 1,500 NIMR vehicles, it subsequently purchased 4,500 MRAPs from US firm Oshkosh. Private sector sales have had a greater tangible degree of success with Streit Group successfully exporting its products to a wide array of countries in Africa and Asia, including Afghanistan, Iraq, Libya, Nigeria, the Philippines, Singapore, South Sudan, and Sudan. Since its expansion in the UAE, Streit Group has gone on to establish a presence in Iraq, Pakistan, Turkey, the UK and the US. The differing levels of success highlight the failure of the local, state owned industry to compete in the international market, even though the demand for armoured vehicles from Africa and Asia is high. Stuck between providing domestic capabilities and creating commercially successful platforms, the domestic production of armoured vehicles within the UAE has stagnated. The UAE could learn from the success of the private sector and target poorer countries with more rudimentary designs. Rational assumptions would suggest that lower oil prices would reduce regional military spending; so far, however, there has not been a detrimental effect. The military spending behaviour of the UAE and other GCC states has maintained a consistent policy of above-average yearly expenditure. 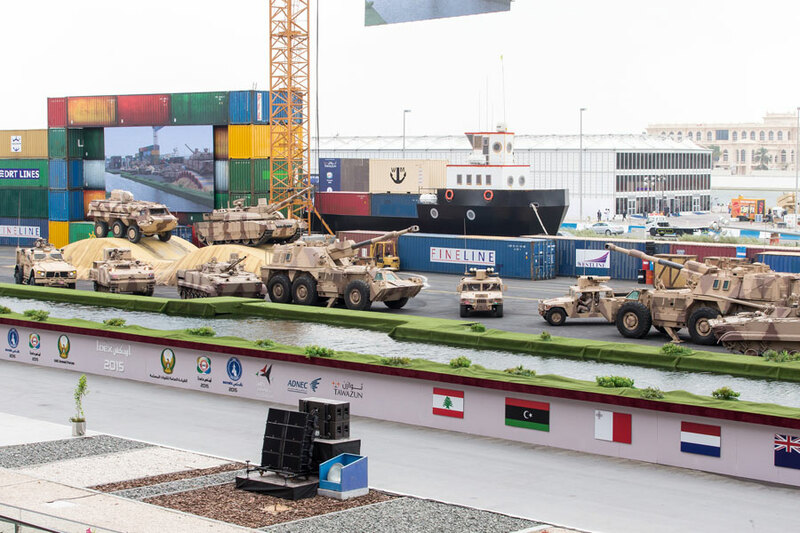 However, the UAE’s adoption of a joint logistics model indicates a possible attempt by other states to follow an optimised strategy to enhance military procurement. Fostering the development of indigenous, cost-efficient manufacturing and maintenance capabilities, ensures the UAE and other MENA states a continued ability to operate and respond to threats, thus ensuing their long-term competitiveness. Much of the technology transferred to the UAE has been used to build domestic capabilities and has come from non-traditional partners: Belarus, Romania, Russia, Serbia, and South Africa. While the UAE, and other states, are likely to continue to import prime, industry leading Western technology to provide the bulwark of capabilities, they will also continue to facilitate the osmosis of proficiencies to provide long-term sustainability and educational development. The evolution and diffusion of asymmetrical, predominantly urban-based threats has induced the development of armoured vehicle production within the MENA region. Abu Dhabi’s interpretation of threats is entirely domestic in nature, and indicates why in response to the Arab Spring, the UAE purchased more than 5,000 MRAPs and other armoured vehicles. Like other aspects of the UAE defence industry, the development of capabilities is entirely at the behest of foreign OEMs and other technology partners. While the development of Emirati armoured vehicle capabilities was initially aimed at supplementing capability deficiencies, UAE-based armoured vehicle production is beginning to provide capable research and development (R&D) to independently develop armoured vehicles. Matthew Hedges holds a Masters Degree in International Relations of the Middle East from the University of Exeter. He is PhD candidate at the University of Durham where he is researching defence and security policy in the GCC.